I’ll hand it to the believers of “Back to the Future” day. It’s incredibly coincidental that the Cubs were in the post season mix on October 21, 2015. They didn’t win the whole enchilada as the film predicted. Instead,they fell to the New York Mets. Swept away until next year. As a Mets fan who has had to suffer the loses, the disappointments, the heartache of a team that builds up your hopes and then lets you down hard – I empathize with Cubbie fans today. The shock and sheer demoralized looks on your faces last night was heartbreaking. Yes, my team did it, but we do know how you feel. Just look at the 2000 World Series – when our hated enemy in the Bronx danced on our field after winning the whole thing. Or the 2006 NCLS when Beltran swung with the bases loaded in the bottom of the 9th. Or in 2001 when Armando Benitez gave up runs like candy when we were within a whiff of being #1 in the NL East. Crushing, heart stopping disappointing losses. With many more before that I can’t even get into. We share the spotlight with the corporate, refined Yankees. Our two world series wins cannot compare to “27…count ’em…27 rings, baby!” in your face by fans of the Bronx Bombers. Yes, 15 years since an NLCS Pennant win and 29 years since a World Series victory is nothing compared to 107 years World Series-less and 70 years pennant-less. But it doesn’t negate the Mets hard luck either. The Cubs just have worse bad luck. And competition for who has the worse luck the longest doesn’t mean that team deserves to win more or less. The winner just — is. Mets fans are not used to post season runs. If this were the usual year of 2nd or 3rd or last place, where Mets fans carry on and barely care about post season baseball – we would have wanted the Cubs in the big show. Plenty of Mets fans have said this on social media boards. It would have be fun. It would have made things interesting. We’d be hoping the Cubs could prove Marty McFly’s future newspaper right. Just not this year. 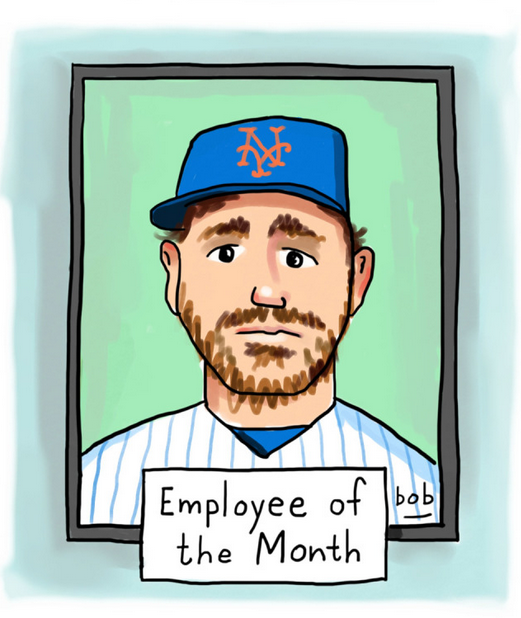 Murphy the goat became Daniel Murphy- our goofy and inconsistent veteran who suddenly snapped into the zone. It’s not over for the Mets. There’s a World Series to be played. I wouldn’t blame Cubs fans if they curse them and cheer for the American League. But don’t. Let’s keep the NL in this. Don’t be haters. It will only stir the bad mojo. Look at Ethier yelling at Mattingly in the NLDS. Look at Bryce and Pappelbon shoving each other in the dugout in the last games of 2015. That’s bad losing. That just bad everything. It creates bad blood and bad blood seems to lead to bad karma. Until next year, Cubs. Peace. Categories: Chicago Cubs, Mets, MLB, NLCS, NY Mets, World Series | Permalink.